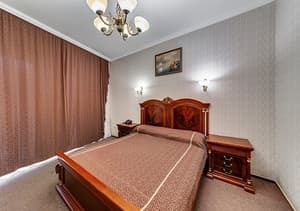 AT THE 30.06.2017 THE HOTEL ACCOMPLISHED DISCOUNTS: 15% ON FAMILY AND PRESIDENTIAL, 10% ON THE BUSINESS CLASS. 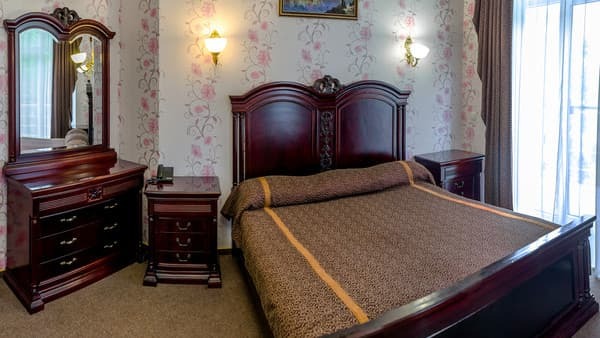 The hotel "Venice" is located in the city of Zaporozhye, 100 meters from the public sandy beach, in a picturesque place - on Naberezhne highway. The hotel offers 18 rooms of different categories with exclusive interior and expensive equipment, each of which includes: mini bar, telephone, air conditioning, cable TV, free Wi-Fi. 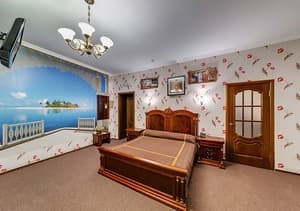 The rooms also have large panoramic windows, from which a chic view of the park area, the Dnieper River and the island of Khortytsya. Description of the room: The room consists of one spacious and at the same time cozy room with a balcony. The room has a mirror wardrobe, a large bed with an orthopedic mattress, a coffee table, a dressing table with a large mirror, and two bedside tables. The bathroom is equipped with a shower box with hydromassage, a full set of bath accessories: bathrobe, slippers, bath towel, facial towel and foot towel; individual set for personal hygiene: soap, shampoo, shower gel and cap, toothbrush and toothpaste, machine. Description of the room: Junior suite with double bed. Description of the room: The room consists of one spacious cozy room, maybe with a balcony or without a balcony. The room has a mirrored wardrobe, two twin beds with an orthopedic mattress, a coffee table, a dressing table with a large mirror, two bedside tables. The bathroom is equipped with a shower box with hydromassage, a full set of bath accessories: terry bathrobe, slippers, bath towel, facial towel and foot towel; individual set for personal hygiene: soap, shampoo, shower gel and cap, toothbrush and toothpaste, machine. Description of the room: The room consists of one spacious, comfortable room with a balcony. 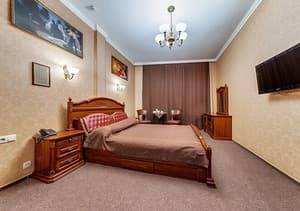 The room has a mirror wardrobe, a large bed with an orthopedic mattress, a coffee table, a dressing table with a large mirror, and two bedside tables. The bathroom is equipped with a shower box with hydromassage, a hairdryer, a full set of bath accessories: a bathrobe, slippers, a bath towel, a facial towel and a foot towel; individual set for personal hygiene: soap, shampoo, shower gel and cap, toothbrush and toothpaste, machine. Description of the room: The room consists of two spacious rooms. 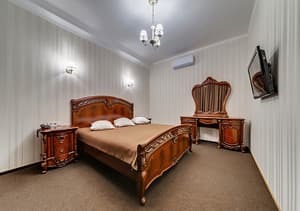 The room has a mirror wardrobe, a large bed with an orthopedic mattress, a coffee table, a dressing table with a large mirror, and two bedside tables. The bathroom is equipped with a shower box with hydromassage, a full set of bath accessories: terry bathrobe, slippers, bath towel, facial towel and foot towel; individual set for personal hygiene: soap, shampoo, shower gel and cap, toothbrush and toothpaste, machine. 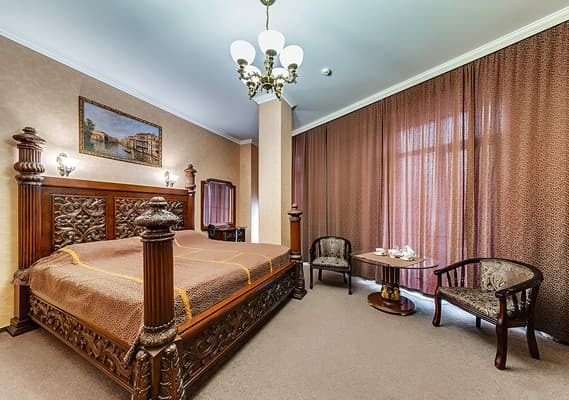 Description of the room: Cozy spacious room, designed in classical style. It consists of 2 rooms. In one room there is a large comfortable double bed, and in the other there is a two-sleeping sofa. 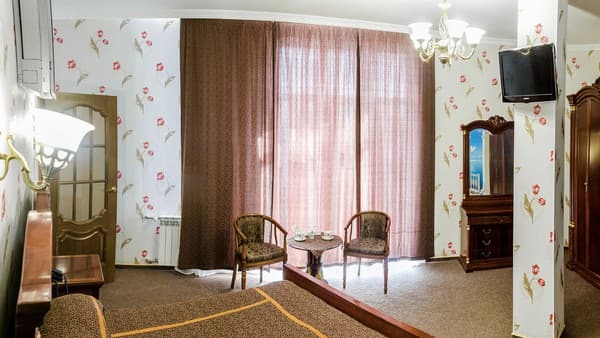 The room has a balcony and large panoramic windows with views of the Dnieper. The room has everything you need including high-speed Wi-fi, air conditioning, safe, modern TV and minibar. Children under 10 years old stay free of charge. The room rate includes breakfast from 8:00 to 12:00 and lunch from 12:00 to 17:00. The Venice Hotel is 100 meters from the public sandy beach, and Khortytsya Island is only 10 minutes away by car. The bus stop is 100 meters from the hotel. The distance to the railway station "Zaporozhye 1" is 9 km, to the central bus station - 7.7 km. 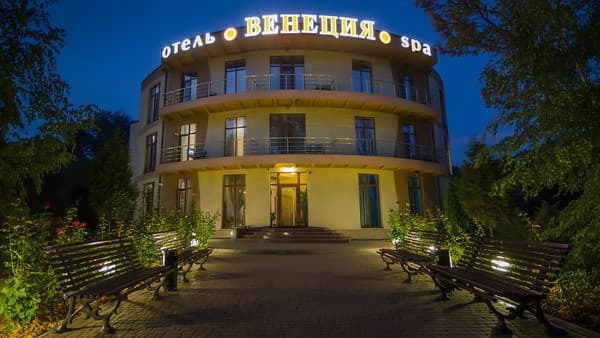 Hotel "Venice" (Zaporozhye) offers all comers to take a bath in real baths, which distinguishes our hotel from other local institutions. On the territory of the hotel "Venice" there are baths for every taste - Russian bath and Turkish bath (hammam), as well as SPA-procedures and massage. Bath club "Venice" (Zaporozhye) - works round the clock. Also, everyone (and not only the hotel guests) can use the services of a massage therapist. By bus, you can go directly to the bus station and the railway station without a transfer.